We dug this Career Builder ad where a Jiminy Cricket-type character brings inspiration to a despondent white collar grunt -- then gets eaten by a spider. Looks like CB's learned how to make good use of irony for its new slogan: "Start building." We thought it would be a lamer campaign than it's turning out to be. Way better than the cheesy high-intensity office-as-jungle thing they were doing last year. And hey, you can't go wrong with maul-by-spider. LOTR did it, and so did Steven King in It. We saw the teaser. We saw the lizard telling his parents he'd be staring in a Super Bowl commercial with Naomi Campbell. Well, this is the result and we like it a lot. We like the effects, the production value, the creativity, the interaction between Naomi and the lizards. Oh, and then there's Michael Jackson's Thriller, a reminder he once was almost normal. Nice job, BBDO. See the commercial here. Now this Tide commercial is one you just love to watch over and over. In an interview, a man who is attempting to explain why he is the right guy for the job, is distracted, as is his interviewer, by a nasty stain on his shirt...that talks when he tries to talk. Get it? Distracting stains? Distracting noises? In other words, it's best to use Tide to remove your stains before you head to an interview. We like this commercial. We like it a lot. It drives home the point (with a sledgehammer) that a stain is very distracting and can affect your daily life in a bad way. So now we know using FedEx is a far wiser delivery solution tha carrier pigeons. In FedEx's Super Bowl spot, we have an underling discussing the use of pigeons as a method of delivery., All seems well until we look outside and see pigeons reeking havoc attempting to make deliveries. The boss say, "We better stick with FedEx. There's a lot of drama in the ad. Crashing windows. Cars being mangled. When that;s coupled with the calm demeanor of the boss and his employee, it makes for interesting viewing. The Bud Light Fire commercial turned out to be a bit more comical than we had assumed it would be. We have a guy demonstrating his ability to light candles during a romantic dinner until he asks his date if she had cats. Of course, he's allergic and he begins to sneeze...fire. Good stuff. Typical Bud Light humor but amusing enough for Super Bowl audiences. 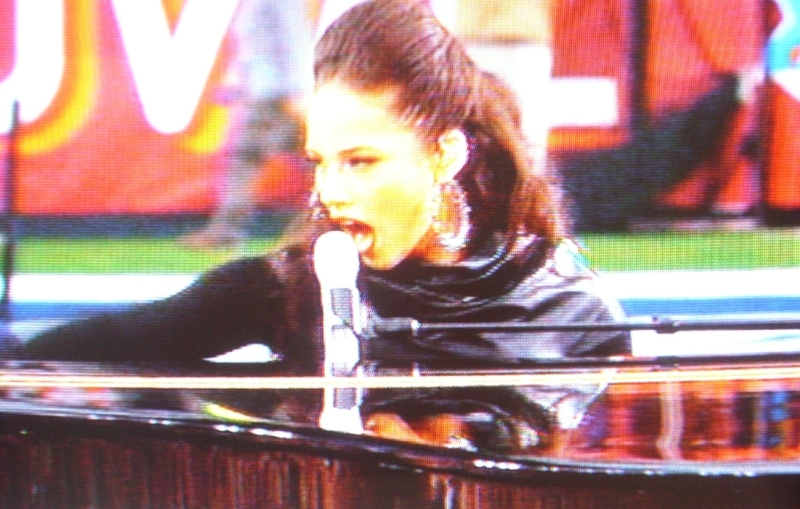 Alicia Keys made a rousing appearance during the Super Bowl 2008 Pre-Game Show which the crowd appeared to enjoy. Nice. Safe. No wardrobe malfunctions. All good in the eyes of FOX and the NFL.